While clearly largely famous for being “the final frontier”, “space” is also notable for coming at something of a premium in many a caravan or motorhome. Despite these multi-dimensional shortcomings, it has not deterred at least one 23rd century doyenne of Starfleet from boldly going to Manchester’s Eventcity to open this year’s Caravan and Motorhome Show. 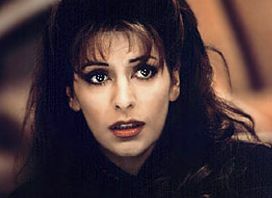 According to The Caravan Times, Prolific North’s preferred sources of all news prefabricated mobile leisure residence related, Marina Sirtis (better known as Counselor Troi in Star Trek: The Next Generation – if still unclear, ask someone in the digital department), will be “beaming down” to the event with her “phaser set to stun”. She’s officially there to open the proceedings, though, rather than to “discover, strange new worlds”. With Bill Oddie and John Craven also listed among the attractions, parking may not be an issue.